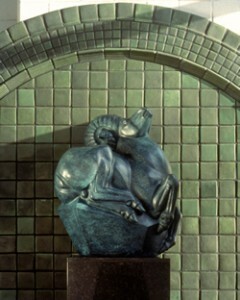 The emotional and spiritual beauty of this cast bronze sculpture fuses with the functional form of the station architecture. Mr. Fredericks, who has earned an international reputation for exhibitions, awards and monumental sculptures, captures the warm and gentle spirit of this beautifully regal ram. The lush green backdrop for this piece, designed by Pewabic Pottery, is created from handcrafted historic Pewabic tiles donated by the Stroh Brewery Company.